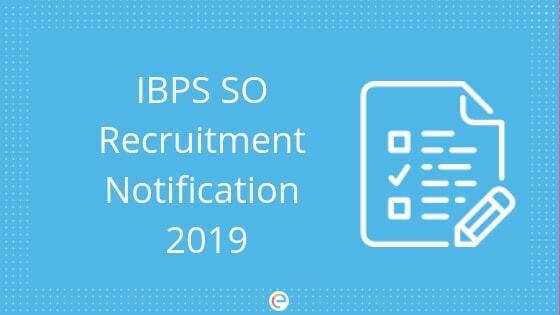 IBPS SO Notification 2019: The IBPS SO Notification for the year 2019 has been issued. Now that the notification been released, candidates should start preparing immediately. The competition will be high since the total number of candidates are expected to increase. To work as a Specialist Officer under IBPS is a matter of prestige. The salary is decent, the incentives are good and the respect is high. Also, there is a scope for a significant amount of growth in one’s career. The candidates who are eligible and aspire to join any of the Participating Organisations listed under IBPS for 2019 are required to register for the Common Recruitment Process (CRP SPL-VIII). The examination will consist of 3 main stages – prelims, mains and PI. Candidates shortlisted will be provisionally allotted to one of the Participating Organisations keeping in view the spirit of Government Guidelines on reservation policy, administrative convenience, etc. Institute of Banking Personnel Selection is an autonomous body. It has received a mandate from certain organisations (that have been mentioned in the table below) to conduct the IBPS Specialist Officer recruitment 2019. All arrangements will be made by IBPS for conducting the online preliminary examination, declaring the result of the online preliminary examination, informing the shortlisted candidates about the online main examination, declaring the results of the online main examination and informing the shortlisted candidates about the interview. Interviews will be conducted by the participating organisations and coordinated by the Nodal Bank in each state and union territory. Institute of Banking Personnel Selection has issued a total of 1590+ vacancies for the year 2019. This is a good opportunity for aspirants who have been waiting for the IBPS SO Notification 2019. A candidate must be either – (i) a Citizen of India or (ii) a subject of Nepal or (iii) a subject of Bhutan or (iv) a Tibetan Refugee who came over to India before 1st January 1962 with the intention of permanently settling in India or (v) a person of Indian origin who has migrated from Pakistan, Burma, Sri Lanka, East African countries of Kenya, Uganda, the United Republic of Tanzania (formerly Tanganyika and Zanzibar), Zambia, Malawi, Zaire, Ethiopia and Vietnam with the intention of permanently settling in India, provided that a candidate belonging to categories (ii), (iii), (iv) & (v) above shall be a person in whose favour a certificate of eligibility has been issued by the Government of India. The minimum age for aspirants of IBPS Specialist Officer recruitment is 20 years and the maximum age is 30 years. This means that a candidate must have been born not earlier than November 2, 2018, and not later than November 1, 1998. Rajbhasha Adhikari – Scale I Post Graduate Degree in Hindi with English as a subject at the degree (graduation) level OR Post graduate degree in Sanskrit with English and Hindi as subjects at the degree (graduation) level. HR/Personnel Officer – Scale I Graduate and Two Years Full time Post Graduate degree or Two Years Full time Post Graduate Diploma in Personnel Management / Industrial Relations/ HR / HRD/ Social Work / Labour Law. Marketing Officer – Scale I Graduate and Two Years Full time MMS (Marketing)/ Two Years Full time MBA (Marketing)/ Two Years Full time PGDBA / PGDBM/ PGPM/ PGDM with specialization in Marketing. NOTE: Candidates should ensure that the educational qualification possessed by them shall be as per the prescribed educational qualifications mentioned in the advertisement and they fulfill the above eligibility criteria. No equivalent educational qualification shall be considered as eligible by IBPS or Participating Organisations. A candidate is required to pay a sum of Rs. 600/- if he/she belongs to General or OBC category under IBPS Specialist Officer recruitment. For candidates belonging to SC, ST or PWD categories, a sum of Rs 100/- needs to be submitted. Both the preliminary stage as well as the mains stage is conducted in online mode. There will be negative marking applied to both the stages. The paper will be set in both English and Hindi language respectively. Will the vacancies be fixed under IBPS SO Recruitment 2019? No. The vacancies under IBPS SO Recruitment Notification are subjected to modification. Is the exam pattern liable to change for IBPS SO Recruitment 2019? In case there are any changes, IBPS SO Recruitment notice with the latest changes will be issued. Under IBPS SO Recruitment, what will be the duration of the exam? Under IBPS SO Recruitment, the exam duration will be of 120 minutes. Is there any negative marking under IBPS SO Recruitment? Yes. There is a negative marking of 0.25 for each wrong answer. The marks of which stage under IBPS SO Recruitment will be considered for final selection? The score for Mains and Interview will be considered in the final selection. With a detailed article on IBPS SO Notification, Embibe hopes you are clear with all the doubts regarding the same. The IBPS SO Exam is not far away so you should start the preparation right away. Do not delay further to start off as the more you delay the more confusion you will have at the last moment. Along with the preparation, you can practice as many papers you can. Also, practice Bank Mock Test Series to provide a finishing edge to your study. If you have any confusion with IBPS SO Notification, drop down your queries in the comment section below and we will get back to you. What is the salary of SO ? Can u tell me latest pay scale ? In Hand Salary – INR 24000-32000 per month. How to prepare for Agricultural Officer ? We’ll be writing an exclusive article for preparation. Do read. Good morning Lalit. The online registrations will begin from November 7th. The link will be activated on the official site of IBPS on the same day itself. First of all, there’s nothing called as copy pasting when it comes to notifications since they comprise a very significant component of public information. Secondly, about preparation, we have exclusive articles for preparation – overall as well as stream wise. I’m assuming you couldn’t locate those since the website is currently undergoing a full revamp. Our users mean everything to us. I apologize for the inconvenience caused. In case you’re still interested for preparation tips, let me know your stream. I’ll direct you the article. I won’t recommend coaching at this point in time. I insist you go for self study. If you need any assistance , we will help you. Iam currently in btech final year..am i eligible for IBPS SO?? Could you please tell final year btech students are eligible or not? No Anusha. You are not eligible until you have completed your course. Hi Amba, Kindly go thorough this article https://www.embibe.com/exams/ibps-so-preparation/ where you can find the best books for IBPS SO. You can start your preparation right away. Give your best shot, you still have a month left for the exam. There is nothing to lose, in fact, the preparation for this exam will boost your confidence and make you ready to take other banking exams as well. Go ahead, we wish you all the best! Can someone please tell me whether a M.E. grad can apply for hr/personal officer post. No Sathish. A M.E. (Mechanical Engineering) Graduate cannot apply for this. Yes. You can check in the eligibility section. They have not specifically mentioned about EEE there. could you please clarify? I have the same doubt. You are eligible. Although it has not been mentioned Electrical. But you have studied Electronics in Electrical and Electronics(EEE) course. Hence EEE students are eligible. Please suggest books for IBPS SO HR Officer.